The Kurds are a large ethnic group of about 25 million people who have always lived in the same region, and who trace their roots back to the Medes of ancient Persia (the frontier of what is now Iraq, Iran and Turkey) more than 2,500 years ago. In fact, the Magi, or wise men, who traveled from the East to deliver their gold, frankincense, and myrrh to the newborn Jesus in Bethlehem were most likely Zoroastrian priests, ancestors of the modern Kurds. The Kurds are tribal people and many of them lived, until recently, a nomadic lifestyle in the mountainous regions of Turkey, Syria, Iraq and Iran. Their refuge has always been the mountains, with their steep pastures and fertile valleys. They are Kurmanji speakers. In the wake of World War I, with US President Woodrow Wilson's call for "self-determination" echoing loudly, the Kurds were promised a homeland - Kurdistan - in the Treaty of Sevres (1920). However, the victorious allies backed away from their pledge in an attempt to court the new Turkish regime of Kemal Ataturk, and in fear of destabilizing Iraq and Syria, which were granted to Britain and France, respectively, as mandated territories. The 1923 Treaty of Lausanne thus abrogated Kurdish independence and divided the Kurds among Turkey, Iraq, and Syria. Ataturk's discrimination against Turkey's Kurdish population began almost immediately, with Kurdish political groups and manifestations of cultural identity banned outright. In the immediate aftermath of the Second World War, the Kurds of Iran, with Soviet support, succeeded in establishing the first independent Kurdish state (the Kurdish Republic of Mahabad). But this was quickly crushed by Iranian troops. Today, Kurds are the largest ethnic group in the world without a state of their own. They are unevenly distributed between Turkey, Iran, Iraq, Syria, Armenia and Azerbaijan. If the Middle East map were to be redrawn to give the Kurds their own boundaries, Kurdistan would be as large as France, stretching over 200,000 square miles. 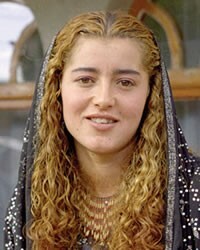 Kurdish society consists mainly of tribes that arose from a nomadic and semi-nomadic way of life in previous centuries. It is strongly fragmented and is often split by internal disagreements. So far in history, the Kurds have never really managed to unite in their common cause. Their primary loyalty is to the immediate family, and then to the tribe. Tribe allegiance is, however, based on a mixture of kinship and territorial loyalty. 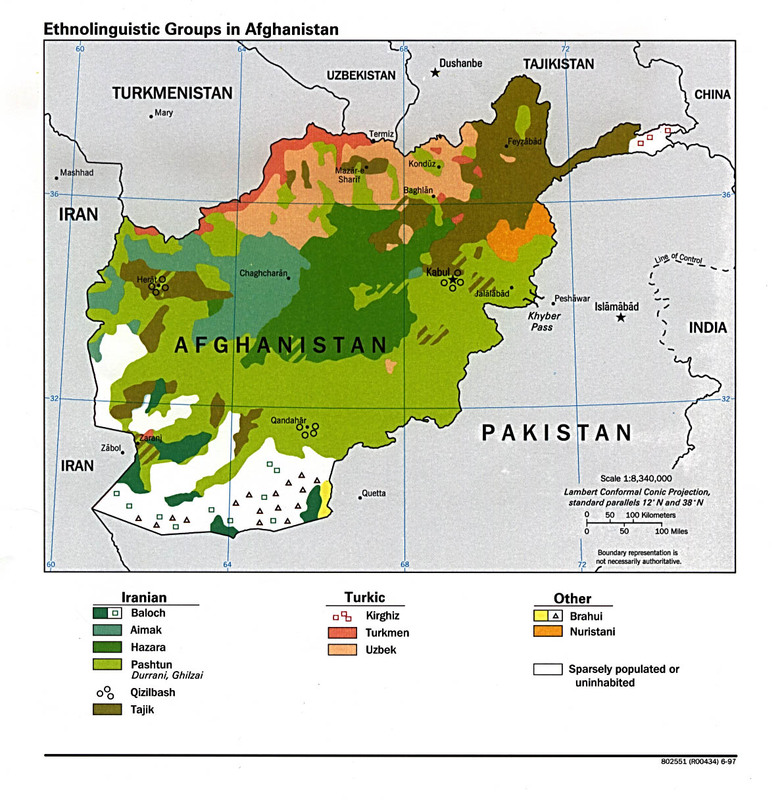 Many Kurds of the lower regions are not organized in tribes, but even there, strife is common between the different clans and communities. 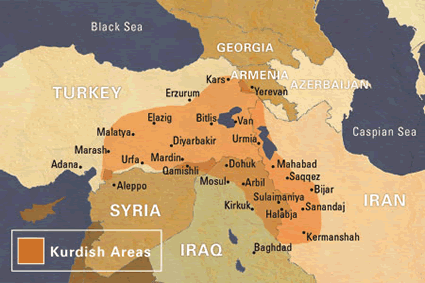 The Kurds of Iraq live along the country's northeastern borders with Turkey and Iran. Most are farmers and all but a few thousand have given up the semi-nomadic lifestyle of the past in favor of settled farming. The Kurds of Iraq form nearly one third of the Iraqi population. After having given their support to Iran in the war against Iraq in 1980, the Kurds experienced Saddam Hussein's terrible revenge, with the Iraqi government declaring war against the Kurds. This war would be known as "al-Anfal" ("The Spoils"), a reference to the eighth sura of the Qur'an, which details revelations that the Prophet Muhammad received after the first great victory of Islamic forces in AD 624. "I shall cast into the unbelievers' hearts terror," reads one of the verses; "so smite above the necks, and smite every finger of them ... The chastisement of the Fire is for the unbelievers." Anfal, officially conducted between February 23 and September 6, 1988, would have eight stages altogether. For these assaults, the Iraqis mustered up to 200,000 soldiers with air support -- matched against Kurdish guerrilla forces that numbered no more than a few thousand. In this war 200,000 Kurds were killed and 5,000 of their villages and towns were destroyed. Among other incidents, 5,000 inhabitants were killed by chemical warfare when Saddam's forces attacked the Kurdish town of Halabja in March 1988. The anti-Kurdish campaign was both genocidal and gendercidal in nature. "Battle-age" men were the primary targets of Anfal, according to Human Rights Watch / Middle East. The organization writes in its book Iraq's Crime of Genocide: "Throughout Iraqi Kurdistan, although women and children vanished in certain clearly defined areas, adult males who were captured disappeared en masse. ... It is apparent that a principal purpose of Anfal was to exterminate all adult males of military service age captured in rural Iraqi Kurdistan" (pp. 96, 170). Only a handful survived the execution squads. The Kurds of Syria make up about one tenth of the Syrian population. They live in two separate enclaves along the northern border with Turkey. In an effort to dilute the Kurdish population, Syria has relocated large numbers of them, perhaps 100,000 or more, into southern Syria and has settled them among the Arab population. By forcing Kurds to resettle and disperse, the Syrian government hopes to assimilate them into the larger Arab society and thus avoid a potential threat. It has been said that Kurds "hold their Islam lightly", meaning that they are not so strongly committed to Islam, and do not identify as closely with it as Arabs do. This is perhaps due to several factors, one being that many Kurds still feel some connection with the ancient Zoroastrian faith, and they feel it is an original Kurdish spirituality that far predates the seventh century AD arrival of Muhammad. Nonetheless, most Kurds are Muslims, and today about three quarters are members of the majority Sunni branch (at least nominally). As many as four million Kurds are Shiite Muslims, living mostly in Iran where the Shiite faith is predominant. In Turkey, where the largest contingent of Kurds lives, the Kurds are seen as a threat by the Turkish government which has continually sought to assimilate the Kurds into Turkish society through forced resettlement. Until recently, it was a crime to speak Kurdish in public. Tribalism is still a factor among Kurds, promoting many different factions which weaken the possibility of an independent homeland. The Kurds in Iraq have hurt their own cause with infighting between the two primary parties, the Kurdistan Democratic Party (PDK) and the Patriotic Union of Kurdistan (PUK). Although the engagement of the UN in northern Iraq has necessarily also given continuity to the political cause of the Kurds, the question of Kurdish autonomy remains unresolved. One possible solution to this problem is to achieve genuine agreement on some kind of self-government. View Kurd, Central in all countries.